It’s nearly a year ago that I first used China’s new high-speed rail (HSR) when travelling from Beijing to Hangzhou. It was a fascinating experience. A New York Times article again drew my attention to the perhaps most ambitious infrastructure project a single nation has ever undertaken. It also made me dig out the one and only photo of a train I took. And no, I have no idea who this person is. The NYT article is fairly celebratory of the investments. After all, they have transformed China’s backward rail grid into the world’s biggest HSR network within record time. There are now 2,000 daily train trips operating on the 6,000+ miles of tracks. Plans exist to extend coverage to as far as Urumqi in Xinjiang province. By that time (as early as 2020), we’d be looking at a total network length of about 30,000 km. 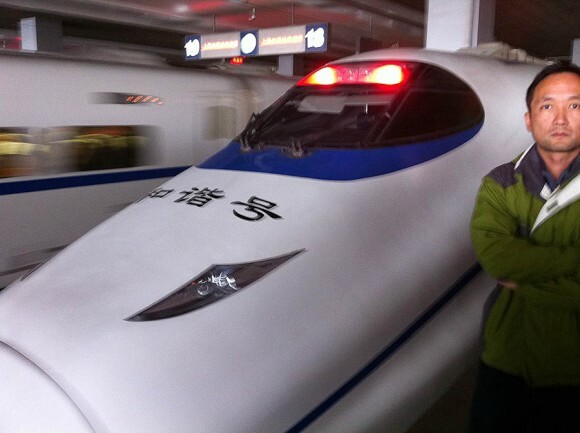 Despite the 2011 crash near Wenzhou, the safety record of Chinese HSR is actually pretty decent, although no match to the nigh-impeccable sheet of the Japanese counterpart Shinkansen. Concerns are that the mishmash technology and sloppy construction standards could lead to more wear and tear. Interesting insights into the impact this massive grid has come from spatial economics. I remember discussing this with Yukon Huang (formerly of the World Bank in Beijing). He said that the Bank usually took a mildly sceptical position on large infrastructure projects (reminding me of the discussions Japan had with the Bank on the Shinkansen back in the 1960s). When motorways were conceived as 6-lane highways, the instinct was to consult the Chinese side to go for four lanes instead. However, a few years after opening, the Chinese authorities needed to build an additional few lanes or a new highway altogether, as actual traffic exceeded planned figures by far. As regards HSR, a similar story seems to be at play here, both in terms of passenger numbers and the degree of urban development occurring around the formerly deserted suburban stations, as the New York Times reports. Yet what measurable benefit have the investments really brought? This question is tough to answer. It may not make much economic sense to build such large networks in a country at China’s level of development. Huge capital-intensive investments should perhaps be occurring later down the line of economic development. Better local roads as well as other more basic infrastructure could arguably have higher returns, given that China’s population is still to a large extent rural. What is more, the HSR investment push is at the heart of China’s reliance on capital intensive and investment led growth. In an eventually vicious circle, ever more investment is needed to sustain this growth as consumption fails to take over as the engine in the absence of painful political choices. As a result, debt piles up. Often issued short-term, rollover becomes a big problem during times of economic distress. So while not at the heart of China’s looming debt problem, HSR is part and parcel of an eventually unsustainable Chinese growth model (see here my blog on Japan’s model with references and relevant links pertaining to China). And from a pure cost-benefit point of view, many HSR projects may not make much sense either. Although ridership on the HSR is higher than expected, ticket prices are often fixed. Rail companies cannot earn nearly enough to compensate for the huge upfront investments. Whether or not they make enough money to maintain the expensive capital stock is another important question. However, there is also merit in thinking more long-term. As the urban population now exceeds the rural one and will continue to grow rapidly, the HSR grid both acts as a catalyst for this development as well as becomes an investment into future connectivity. There appear to be large structural changes occurring in connected cities already, as this interesting World Bank study discusses. Economic agglomeration and economic mass (a city’s economy + accessibility to other cities) are useful concepts from spatial economics. Recently made empirical links to productivity seem to suggest that we may have to quantify the impact of the HSR grid much more broadly. Anecdotal evidence seems to suggest this line of thinking. The fact that high-speed connectivity creates positive externalities and thus higher tax earnings down the line is the usual line of reasoning for those favouring HSR in developed countries. Economic losses of building such hugely expensive projects need to be netted off against these difficult-to-measure gains. The World Bank study validates the existence of such externalities in China. They may even be bigger than in developed countries given China’s unique characteristics, above all its size. Fascinating stuff! This entry was posted in China, Economics by benbansal. Bookmark the permalink.